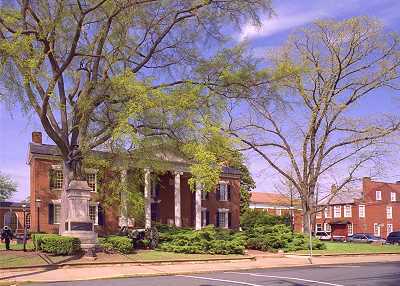 Jackson Park consists of 0.4 acres and includes all of the property bordered by Jefferson Street, Fourth Street N.E., High Street and the Albemarle County Courthouse Building (location). This property, once known as "McKee's Row", was deeded to the City by Paul Goodloe McIntire in 1919 to be used as a park. A narrow lane which once ran between the County Court Building and the park property was called McKee's Lane. 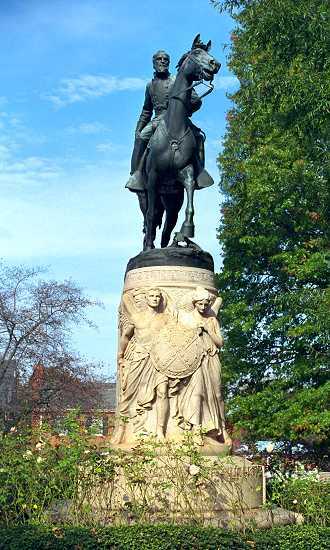 A large equestrian monument of Thomas Jonathan "Stonewall" Jackson, by Charles Keck, is the focal point of the park. The monument was presented by Mr. McIntire as a gift to the city in 1921 and is ranked as one of the three best equestrian statues in the world. The park also contains well-maintained flower beds and a number of benches. (For details on the history and gardens, click here.) Jackson Park, as well as Lee Park, are part of the Virginia Civil War Trails. Both parks also host the annual Governor Jefferson's Thanksgiving Festival with Revolutionary era re-enactments and displays.